I’ve not achieved much in my life, but one of those things I have achieved is watching every Arnold Schwarzenegger film, so obviously I had to see Escape Plan, where he joins forces (again) with Sylvester Stallone. I’m not going to pretend I would have watched it if it starred Adrien Brody and Whoopi Goldberg. From the Expendables movies to Red, The Best Exotic Marigold Hotel and A Late Quartet, to future releases like Last Vegas and Grudge Match, senior citizens are playing big in Hollywood like never before. Yet Arnie and Sly are the only ones still chasing their original demographic and throwing themselves into the action. It’s impressive to see two men pushing 70 in such good shape. Here a bearded Schwarzenegger looks like if Mahmoud Ahmadinejad spent the next thirty years as a mob enforcer. Stallone, on the other hand, looks like Matt Le Blanc’s future self has come back through time to warn him of a nuclear apocalypse, with the voice of Tom Waits. His neck is so thick he has to turn his whole body when he wants to look around. They ain’t pretty, but they sure as hell are tough. 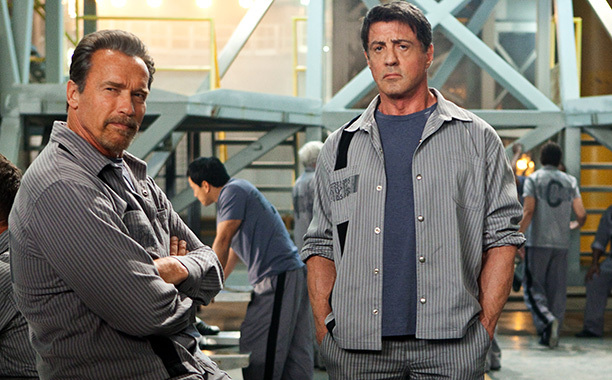 In Escape Plan the two ageing muscle men have to break out of an ultra secure prison. Ray Breslin (Stallone) is a professional prison escapist, and is sent in to test the new facility, where he teams up with Rottmayer (Schwarzenegger) so they can find their way out. It’s basically Shawshank on steroids. This is a B movie which managed to bag itself two massive stars (both in terms of celebrity and physical size). Its plot and mood are on a par with Steven Seagal’s cinematic footnote Half Past Dead, and it’s clearly relying on big names to bring in the bucks. In terms of quality it’s closer to Sly’s recent dud Bullet to the Head than enjoyable Arnie comeback vehicle The Last Stand or ensemble smash The Expendables 2. It’s not even Stallone’s best prison movie (see Lock Up). For what it’s worth, Schwarzenegger turns in one of his better performances. Perhaps Christoph Waltz, Hollywood’s new Austrian on the block, has made him up his game. We get to see him speak German – something he almost never does – in one of his best scenes in the film, and he even manages to convey a character with a level of intelligence, which he failed to do even as super-smart Julius in Twins. What’s surprising is how little action there is. Why hire the world’s greatest action stars then have them spend three quarters of the film talking and planning? Dialogue is neither of their forté. It’s about as easy to understand as Kenny from South Park talking to Sooty, and until the action finally kicks into gear the film is actually boring. It’s not funny, and all the best line is in the trailer. Instead of spending their time scheming they should smuggle in a couple of Uzis and a minigun and blast their way out 1980s style. It also squanders other big names – 50 Cent and Vinnie Jones – by giving them nothing to do. For the first hour you’ll be wishing you had an escape plan. While it has its moments, the thrill of seeing these two stars on screen together has worn off, and what’s left is a sub par action flick. Familiarise yourself with the exits.